Many Are Familiar With How Countries Rank In The Quality Of Life, But What About The Quality of Death? 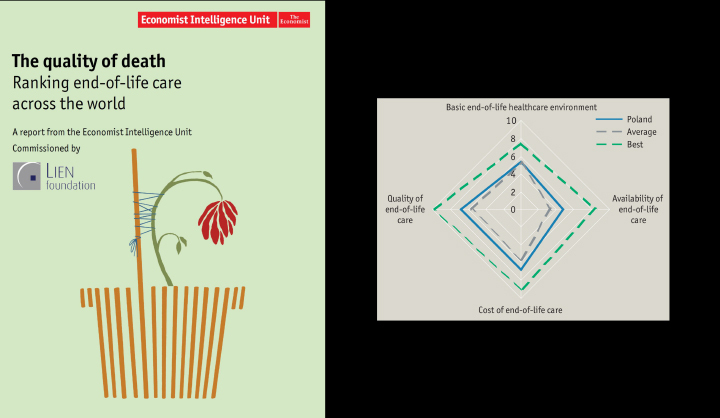 To find out which countries had the best care for the dying, we commissioned the Economist Intelligence Unit to conduct a survey that ranked 40 countries on their provision of end-of-life care. 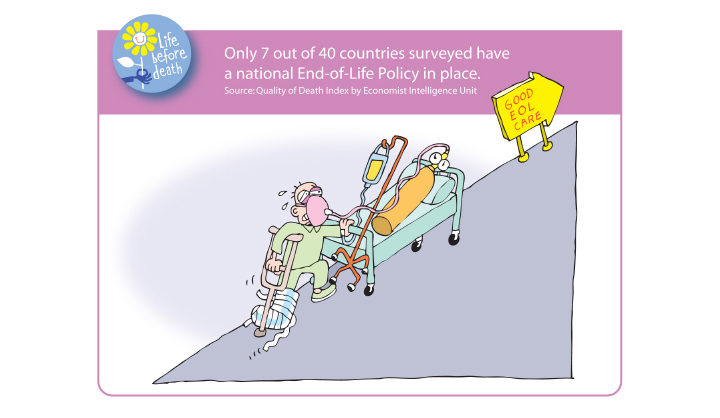 The world’s first Quality of Death index was released in July 2010. Countries that had a longer history of hospice palliative care, like the United Kingdom (First place), Australia (Second) and New Zealand (Third), fared well in the provision of end-of-life care. The survey showed that too many people, even those in countries that have excellent healthcare systems, suffer a poor quality of death. Many rich nations lag in care of the dying: these included Denmark (22nd), Italy (24th) and South Korea (32nd). Out of the countries surveyed, less than a handful had a national palliative care strategy in place. THIS DEATH INDEX: IS IT BEING PUT TO GOOD USE? Affirmative. The Quality of Death Index caught the attention of many – newsmakers, the public, policymakers, hospice professionals and the academics. 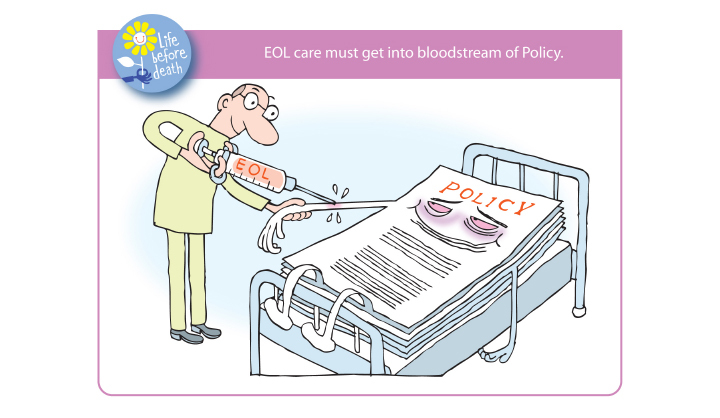 The results compelled policy makers and stakeholders to review their state of care to the dying. In countries like U.K, Canada and Australia, where palliative care existed longer and is better organised, their respective palliative care organisations used the Index results to advocate greater resources for end-of-life care. The Index drew interest and mentions from the world of research and academia, and appeared in respected medical and international policy journals like The Lancet, British Medical Journal, British Journal of Healthcare Management and World Policy Journal. In the online world, the Index spurred many ‘die-logues’ and postings. Blogs like Huffington Post, WSJ.com and CNN Health represented various views, from comparing the ‘best places to die’ to discussing issues concerning the cost and quality of care for the dying. 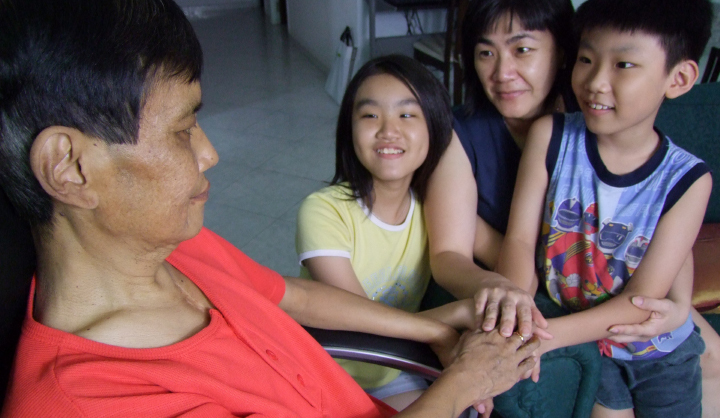 AND WHAT EXACTLY CAN WE DO TO IMPROVE CARE FOR THE DYING IN SINGAPORE? Following from the Index, we got Mr Koh Buck Song to interview and synthesise the insights and perspectives of 30 leaders in Singapore. 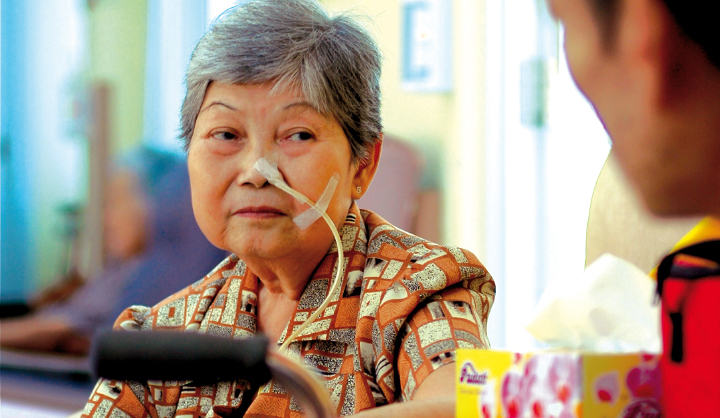 Spanning medical, community and academia, their recommendations were outlined in a report: Living with the End in Mind – A Study of How to Increase the Quality of Death in Singapore. HOW DID DEATH BECOME MORE FRIENDLY? 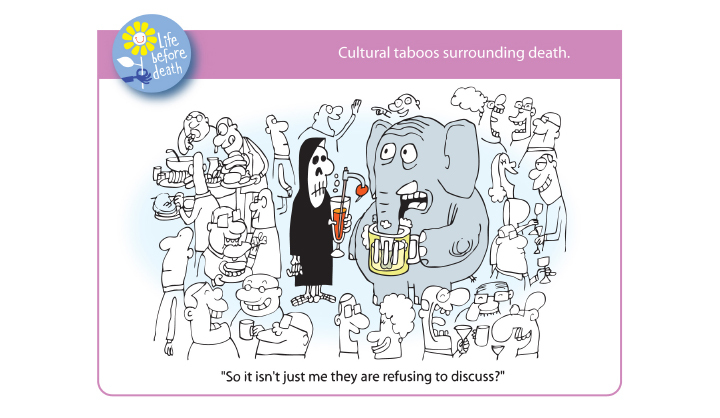 It is important to demystify death and we rolled out a series of public awareness initiatives this year. First, we gave Death a new face. Literally, on Facebook. He gained about 1,000 fans who ‘befriended’ Death on Facebook. His ‘die-logues’ peppered with quips drew responses that ranged from personal experiences, to comments about life and death. He also ‘starred’ in cartoons and Youtube video flicks that were specially created to celebrate Life before Death. The radical attempt to re-brand Death online saw the website www.lifebeforedeath.com enticing viewers to create their very own Last Playlist: a selection of ‘swan-songs’, share their Bucket List: the ultimate to-do list before expiration, or post a note to their loved ones to say the things they had always wanted to. How Did Happy Coffins Make People Happy? 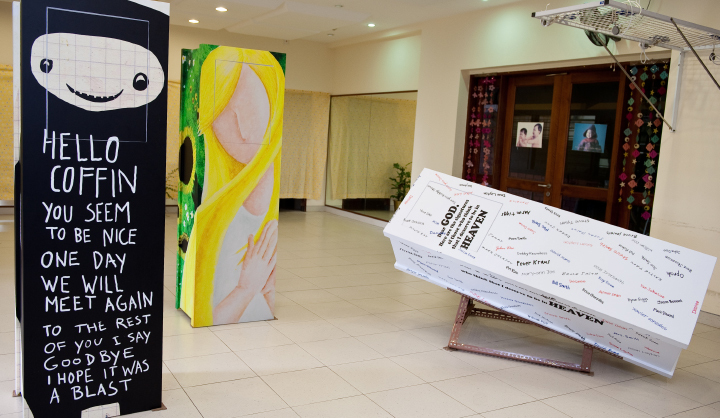 Kitty was part of the Happy Coffins project that sought to overturn the stigma of death by transforming the coffin from a symbol of fear, grief and dread into a celebration of life, love and hope. Besides Kitty, two other nursing home residents, Elsie and Magdalene, also received their customised designer coffins. The “box” is Kitty’s personalised coffin – designed with cheerful tones and sporting images of music notes and little children—reminiscent of her colourful life and the students she taught. She passed away peacefully in 2011 in her own happy coffin. 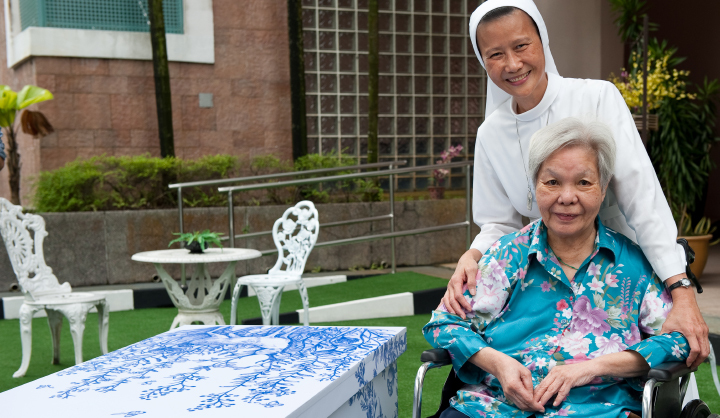 The idea germinated from a conversation with the Home administrator, Sister Geraldine Tan. She said, “This project, though seemingly about death and dying, is really life-giving. It has created a non-threatening platform for our residents to share their lives and talk about their pre-departure hopes and wishes. WHAT WAS THE IMPACT CREATED BY IT? Happy Coffins brought partners together for a common cause: FARM, Eyeka and the Singapore Funeral Services. In addition, the idea captured the imagination of some 730 designers from around the world. They created a myriad of designs in a first-of-its kind competition for the best Happy Coffin. SPH’s CATS Classified organised the annual Life Matters event to promote active ageing and consideration of end-of-life matters. For the second year running, they also organised an arts competition, inspired by Happy Coffins, inviting the public to submit designs of personalised coffins. Happy Coffins also drew interest and responses from as far as Ukraine and Belgium to America and the Asia Pacific. How Did Photographs Capture The Inevitable Departure? Four professional photographers were allowed into the lives of terminally ill patients as they journeyed along their final chapters. Their impending departure became stories of hope, enlightenment and inspiration captured in a book and photo exhibition entitled, Departure: living before leaving — intimate essays of the last journey. The pictures revealed how each patient faced the odds with dignity and courage, braced by the support of their loved ones and the care of hospice professionals. 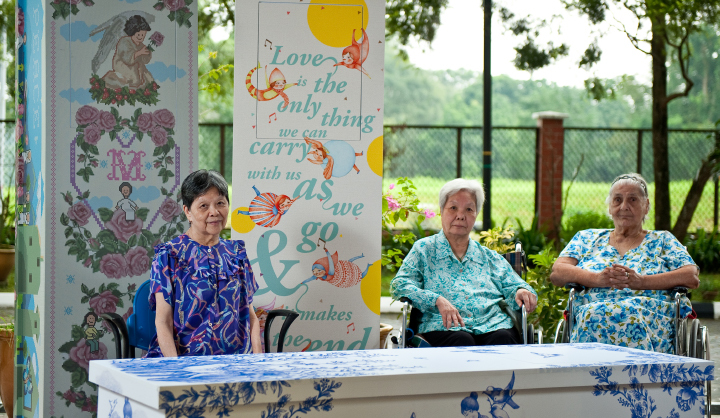 The year long “labour of love” was a collaborative effort of the photographers with us, Singapore Hospice Council (SHC) and adamsapple, a local design house. Proceeds from the sale of books went to SHC.